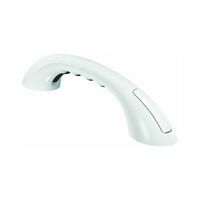 Homebasix Toilet Paper Roller, Plastic, White Moen Toilet Paper Holder, Series: Contemporary, 1 in Width, 1 in Height, Wall, Pivoting Mounting, Horizontal Orientation, Plastic, Glacier Spring loaded, fits most toilet brackets, white finish. 12 pieces. Kitchen sink suction holder for soap, sponges, scrubbers. Attaches to any smooth non-porous surface such as tile, glass, fiberglass and some metals. Made of durable, clear plastic. 3/8" ends. Fits 1" O.D. 3/8" ends. Use this rod cover as the easy way to improve the look of your shower. It fits virtually all shower rods up to 60 In. and installs easily without tools. Metal construction, use on standard 1" diameter shower rod. 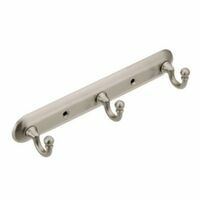 Includes 12 shower curtain hooks. Scratch and rust resistant. Easy to install. Hardware included. Chrome plated for durability. Chrome plated for durability. Scratch and rust resistant. Modern design, die cast appearance. Flat bottom, easy to clean. Easy to install. Hardware included. 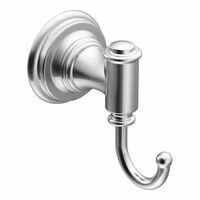 Donner Robe Hook, Series: Contemporary, Modern, 1-3/4 in Height, 2-3/8 in Width, 1-3/4 in Projection, 2 Hooks, Wall, Concealed Screw Mounting, Die Cast Zinc, Polished Chrome, Includes: Mounting Hardware, For Living Bath Accessories 1-3/8" snap-fit type. Steel, bright plated. 12 Pieces. 12 Pieces. 12 Pieces. Fits 1" shower rod, chrome steel. Chrome plated for durability. Scratch and rust resistant. Plastic roller. Easy to install. Hardware included. 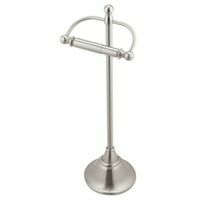 Mintcraft Toilet Paper Roller, Brushed Nickel Power lock suction securely sticks to smooth surfaces. Great for shower walls, mirrors, and more, Constructed with high impact clear plastic. Card of 2. Stands up to hot, wet and humid environments and sticks to a variety of surfaces, including glass, mirror, tile, fiberglass, wood and painted surfaces. Tested and proven to hold better than suction cups, it is easy to apply and come off cleanly without damage. Repositioning is easy with assorted water resistant refill strips. Great for bathroom organization including guest and kids' bathrooms, renters and dorm life! Contains 2 hooks, 2 medium strips. Holds up to 3 pounds. 3-3/8"L x 1-3/8W x 1-1/8D. White plastic, packaged on pegable card. Command assorted refill strips make it easy to move and rehang your Command? Bath Products for cleaning, redecoration or reorganization, holds strongly on a variety of surfaces, including glass, mirror, tile, fiberglass, wood and painted surfaces and stands up to hot, wet and humid environments, remove cleanly with no holes, marks, sticky residue or stains. Contains 2 medium and 4 large strips per pack. Lets you put your soap where you need it - in the shower or by a sink. Perfect for shared bathrooms, dish can be positioned at different heights and out of the water stream. The soap dish stands up to hot, wet and humid environments and sticks to a variety of surfaces, including glass, mirror, tile, fiberglass, wood and painted surfaces. Includes 1 dish and 2 strips. 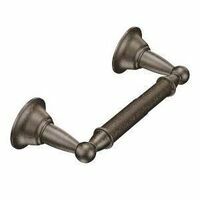 4-7/8"L x 4-3/8"W x 3-1/8"H. Mintcraft Garment Robe Hook, Double Robe, Venetian Bronze, For Kitchens, Bathrooms and Bedrooms- Aprons, Robes and More Adjustable tension holder for 1" OD rods. No screws, no need to drill wall tile. Holds rod firmly in place. Keep your shower accessories in one place that lets them dry between uses. The Multi-Hook stands up to hot, wet and humid environments and sticks to a variety of surfaces, including glass, mirror, tile, fiberglass, wood and painted surfaces. Tested and proven to hold better than suction cups, it is easy to apply and comes off cleanly without damage. Repositioning is easy with assorted water resistant refill strips. Great for bathroom organization including guest and kids' bathrooms, renters and dorm life. Contains 1 multi-hook, 2 large strips. Holds up to 5 pounds. Zinc alloy, with aluminum ring. Bagged. Chrome-plated. Ideal for bedroom and bedroom closets for purses, scarves, clothes, jackets, towels and more. Fits over top of any standard-thickness interior door. 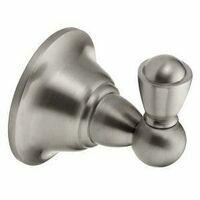 Mintcraft Garment Robe Hook, Series: Manhattan Collection, Double Robe, Wall Mounting, White Polished chrome finish. Set of 12. 100 percent vinyl shower curtain with 12 plastic hooks. Reinforced hanger holes. Easy to clean. PVC 0.06mm (2.4 gauge). 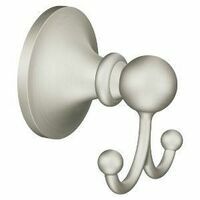 Homebasix Curtain Hook Ball, Chrome 100% EVA, water repellent, odorless and chlorine free. Features magnets at the bottom hem to provide weight and stability to keep in place. 12 mm curtain with reinforced hanger holes. MintCraft Toothbrush/Tumbler Holder, Series: Atlantis Collection, Oval Shape, 14.2 in Length, 13.12 in Width, 14 in Height, Concealed Screw Mounting, White MintCraft Soap Dish Cup, Series: Atlantis Collection, Concealed Wall Mounting, White Coated Ideal for hanging clothes or towels. Fits the top of most standard household doors. 20"W x 11-3/8"H x 3'D. 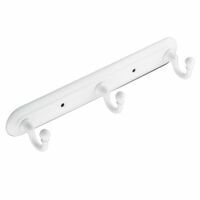 Ideal for hanging clothes or towels. Fits the top of most standard household doors. 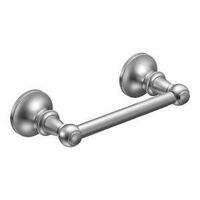 Homebasix Curtain Hook Roller Ball, Highly Durable, Satin Nickel Heavy duty rod. 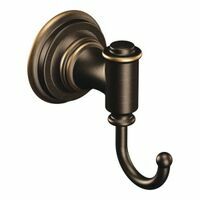 Homebasix Curtain Hook Ball, Venetian Bronze 70" x 72" vinyl liner with rings. This economic combo pack includes a liner that resists mildew and cleans easily with soap and water. Its grommets provide strength and durability while its weighted hem holds securely to the tub edge. Also includes 12 matching plastic rings that are easy to open and snap close for a secure fit. Rod install easily in showers without cutting or drilling. Its patented TwistTight mechanism offers superior strength and durability. Heavy duty rod. Rod install easily in showers without cutting or drilling. Its patented TwistTight mechanism offers superior strength and durability. 70" x 72" vinyl liner with rings. This economic combo pack includes a liner that resists mildew and cleans easily with soap and water. Its grommets provide strength and durability while its weighted hem holds securely to the tub edge. Also includes 12 matching plastic rings that are easy to open and snap close for a secure fit. 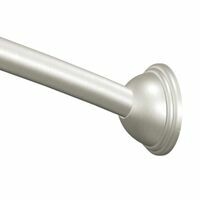 Tension shower curtain rod installs in showers 41"-76" wide. Heavy duty steel. 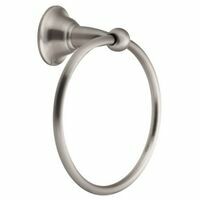 Moen Towel Ring, Round, Series: Aspen, 22 lb Load Capacity, 6.186 in Ring, Concealed Screw, Wall Mounting, 6.19 in Overall Length, 6.19 in Overall Width, 1-3/4 in Overall Height, Zinc Ring, Chrome Plated, Includes: Template and Mounting Hardware Split Finish, brushed steel with chrome accents. Clean and traditional design. This high quality liner is made of heavy gauge vinyl. It resists mildew and cleans easily with soap and water. Its grommets provide strength and durability while its weighted hem holds securely to the tub edge. This high quality liner is made of heavy gauge vinyl. It resists mildew and cleans easily with soap and water. Its grommets provide strength and durability while its weighted hem holds securely to the tub edge. Rod install easily in showers without cutting or drilling. Its patented TwistTight mechanism offers superior strength and durability. Rod install easily in showers without cutting or drilling. Its patented TwistTight mechanism offers superior strength and durability. Tension shower curtain rod. Metal with painting. Extends 36" to 63". Can be used as a shower curtain or a liner. Odorless, mold & mildew resistant, chlorine-free. PVC-free environmentally-friendly, Heavy duty 100% EVA - soft material. 5.5 gauge. Homebasix Shower Curtain, Hookless, Waterproof, 70 in Width, 72 in Length, Vinyl, Clear Homebasix Shower Curtain, Hookless, Waterproof, 70 in Width, 72 in Length, Vinyl, White Heavy duty rod. Completely waterproof. With reinforced button holes. Reinforced top hem for added structure. Clean finish. Ideal for hanging clothes or towels. Fits the top of most standard household doors. Chrome finish. Size: 8-3/4"W x 9-1/2"H x 3"D. Completely waterproof. With reinforced button holes. Reinforced top hem for added structure. Clean finish. Hooks easily slip through the curtain grommet. 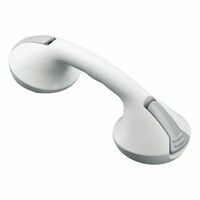 Designed with a slight twist at the back, the shower hooks stay intact and glide along the curtain rod smoothly. Set of 12. Rod install easily in showers without cutting or drilling. Its patented TwistTight mechanism offers superior strength and durability. Rod install easily in showers without cutting or drilling. Its patented TwistTight mechanism offers superior strength and durability. 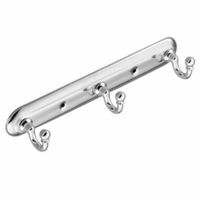 No seam in rod allows for easy gliding of shower hooks, permanently mounts for a secure fit, all mounting hardware is included. Ideal for hanging clothes or towels. Fits the top of most standard household doors. Chrome finish. Size: 14"W x 9-1/2"H x 3"D. Sleeved. Suction mounting, clear. Classic American style, chrome hooks with white plastic accents. Packaged in clear plastic box. View box package. 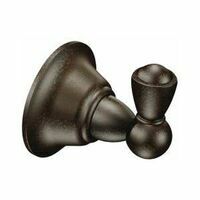 Use these decorative, functional shower curtain hooks on any shower rod and with any shower curtain. The unique design allows shower curtain and liner to be hung or removed independently. 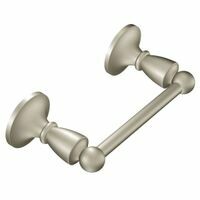 Roller function allows hooks to glide easily over shower rod. 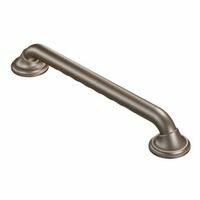 It's easy to install and coordinates with popular bath hardware finishes. 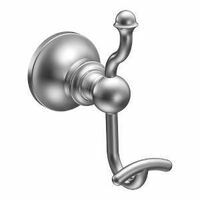 Donner Robe Hook, Series: ISO, Modern, 2.44 in Height, 2.44 in Width, 30 lb, 2-4/9 in Projection, 1 Hooks, Wall Mounting, Die Cast Zinc, Chrome Plated, Includes: Template and Mounting Hardware, For Living Bath Accessories Donner Robe Hook, Series: Vale, Modern, 4.84 in Height, 2.22 in Width, 30 lb, 3.97 in Projection, 2 Hooks, Wall Mounting, Die Cast Zinc, Chrome Plated, Includes: Template and Mounting Hardware, For Living Bath Accessories View box package. View box package. Clear Resipreme with brushed stainless steel accent, non-skid feet, silver scrubby included. Pump holds 16 oz. 100 percent EVA. Rust-proof metal grommets. 15mm/6 gauge. Pegable clear package with color insert. 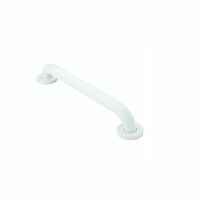 Donner Hand Grip, Suction, Series: Home Care, Modern, 1-1/4 in Rod Diameter, 12.31 in Overall Length, 4.28 in Overall Width, 3.31 in Overall Height, Polypropylene, Glacier/White, 12 in Bar Length Guard fills gap between shower curtain and wall keeping water in tub. Includes caulk and instructions. 11"H x 9.25"L High-quality rod installs easily in showers from 44" to 72" wide without cutting or drilling. Patented TwistTight mechanism offers superior strength and durability. High-quality rod installs easily in showers from 44" to 72" wide without cutting or drilling. Patented TwistTight mechanism offers superior strength and durability. 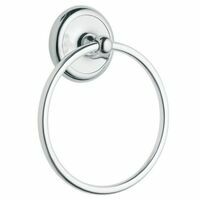 Moen Towel Ring, Series: Preston, 22 lb Load Capacity, 6-1/4 in Ring, Concealed Screw, Wall Mounting, 2-1/4 in Diameter Mount Flange, 2-3/8 in Projection, 7 in Overall Length, Zinc Ring Post, Brass Ring, Polished Chrome, Includes: Template and Mounting Hardware Zinc and stainless steel. 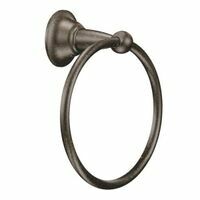 Donner Robe Hook, Series: Yorkshire, Traditional, 1-3/4 in Width, 10 in Length, 30 lb, 2 in Projection, 3 Hooks, Wall, Exposed Screw Mounting, Die Cast Zinc, Brushed Nickel, Includes: Mounting Hardware, For Living Bath Accessories Donner Robe Hook, Series: Banbury, 2.949 in Height, 3.764 in Width, 35 lb, 2.357 in Projection, 2 Hooks, Wall Mounting, Die Cast Zinc, Spot Resist Brushed Nickel, Includes: Mounting Hardware, For Living Bath Accessories Zinc and steel ring. 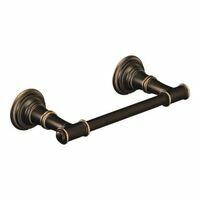 Telescoping design expands to spaces from 41" to 72" wide, decorative ends, permanently mounts with included hardware. Zinc alloy with aluminum ring. 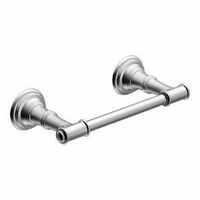 Boxed This high quality rod installs easily in showers up to 72 In. This rod permanently mounts with included hardware. 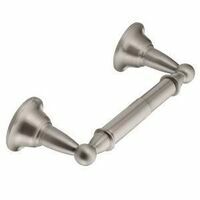 Moen Toilet Paper Holder, Spring Loaded, Series: Yorkshire, 3.13 in Width, 9.69 in Depth, 2.19 in Height, Wall Mounting, Horizontal Orientation, Zinc Alloy, Polished Chrome, Includes: Template and Mounting Hardware Moen Toilet Paper Holder, Series: Preston, 2-3/8 in Width, 6-1/2 in Depth, Wall Mounting, Horizontal Orientation, Zinc Alloy, Chrome Plated, Includes: Template and Mounting Hardware Holds 4 toothbrushes with extra large openings to accommodate spin toothbrushes.White ceramic base with chrome body. 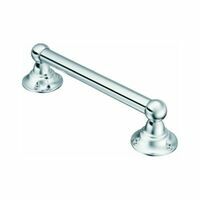 3.1" x 5" x 3.1"
Donner Hand Grip, Series: Home Care, Modern, Designer, 250 lb Load Capacity, 7/8 in Rod Diameter, Wall Mounting, 2.6 in Mount Flange, 2.65 in Projection, 11.6 in Overall Length, Stainless Steel Bar, Zinc Bar Post, Glacier/White, ADA Complaint, 9 in Bar Length Donner Bath Grip, Universal, Series: Home Care, 300 lb Load Capacity, 1-1/2 in Rod Diameter, Wall, Exposed Screw Mounting, 3 in Projection, 18 in Overall Length, 3-1/4 in Overall Width, Stainless Steel, Stainless, ADA Complaint Chrome finish is highly reflective for a mirror-like look that works with any decorating style. 3.06" L x 3.29" W x 2.50" H.
Raised bumps lift bar soap off bottom of the dish allowing it to drain thoroughly. Extends the life of your soap. Durable clear plastic. 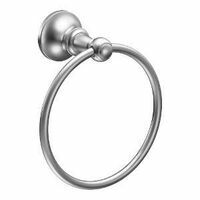 Moen Towel Bar, Series: ISO, 22 lb Load Capacity, Concealed Screw, Wall Mounting, 2.44 in Diameter Mount Flange, Zinc Bar Post, Aluminum Bar, Chrome Plated, Includes: Template and Mounting Hardware Zinc and stainless steel. View box package. View box package. View box package. 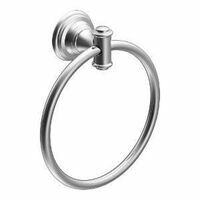 Moen Towel Ring, Series: Banbury, 22 lb Load Capacity, 6 in Ring, Concealed Screw, Wall Mounting, 2.328 in Projection, 6.795 in Overall Length, Zinc Ring Post, Aluminum Ring, Brushed Nickel, Includes: Template and Mounting Hardware Zinc and stainless steel. Zinc and stainless steel. 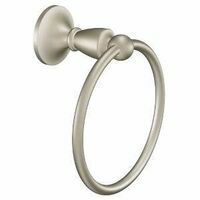 Donner Robe Hook, Series: Sage, Modern, 2.38 in Diameter, 2.815 in Height, 30 lb, 2.565 in Projection, 1 Hooks, Wall Mounting, Die Cast Zinc, Spot Resist Brushed Nickel, Includes: Template and Mounting Hardware, For Living Bath Accessories Donner Robe Hook, Series: Wembley, Traditional, 2.28 in Diameter, 2.64 in Width, 30 lb, 2.24 in Projection, 2 Hooks, Wall Mounting, Die Cast Zinc, Spot Resist Brushed Nickel, Includes: Template and Mounting Hardware, For Living Bath Accessories 1-1/2" knurled chrome diameter, chrome-finished bars may be used horizontally or vertically. 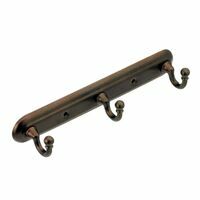 Mounting hardware includes two rubber pads and six 2" rust resistant screws per bar. Mintcraft Toilet Paper Holder, Recessed, Square, Aluminum, White Donner Bath Grip, Series: Classic, Home Care, 300 lb Load Capacity, 1-1/2 in Rod Diameter, Exposed Screw Mounting, 3-3/8 in Projection, 24 in Overall Length, 3 in Overall Width, Stainless Steel, Stainless, ADA Complaint View box package. 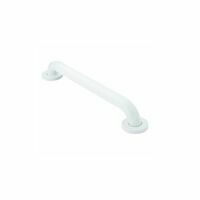 Safety grab bar, 1-1/2" tubing dia., 6-1/8" tall, 6-1/8" wide, and 3-3/16" deep. Maximum cut hole size: 5-1/2" x 5-1/2" Clean and contemporary look. Mirror polished chrome finish. Size: 13''W x 17-1/2"H x 9"D. Boxed. 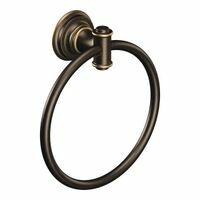 Moen Towel Ring, Series: Sage, 22 lb Load Capacity, 6 in Ring, Concealed Screw, Wall Mounting, 2.38 in Diameter Mount Flange, 3.44 in Projection, Zinc Ring Post, Brass Ring, Brushed Nickel, Includes: Template and Mounting Hardware Moen Towel Ring, Series: Sage, 22 lb Load Capacity, 6 in Ring, Concealed Screw, Wall Mounting, 2.38 in Diameter Mount Flange, 3.44 in Projection, Zinc Ring Post, Brass Ring, Oil Rubbed Bronze, Includes: Template and Mounting Hardware Zinc and stainless steel ring. Moen Grab Bar, Series: Donner, Home Care, SecureMount, 8700, 500 lb Load Capacity, 1-1/4 in Rod Diameter, Concealed Screw, Wall Mounting, 1-1/2 in Projection, 21-1/4 in Overall Length, 3 in Overall Height, Stainless Steel, ADA Complaint, ANSI Specified, CSA Certified, 18 in Rod Length View box card. Pivoting paper holder. Pivoting paper holder. View box card. Moen Toilet Paper Holder, Series: ISO, 3.11 in Width, 6-1/2 in Depth, 2.44 in Height, Wall, Pivoting Mounting, Horizontal Orientation, Zinc Alloy, Chrome Plated, Includes: Template and Mounting Hardware High-quality rod installs easily in showers from 46" to 72" wide without cutting or drilling. Patented TwistTight mechanism offers superior strength and durability. Waterproof, PVC-free, and mold/mildew resistant. Features a clear window to allow light into your shower. High-quality rod installs easily in showers from 46" to 72" wide without cutting or drilling. Patented TwistTight mechanism offers superior strength and durability. High-quality rod installs easily in showers from 46" to 72" wide without cutting or drilling. Patented TwistTight mechanism offers superior strength and durability. Contoured plastic raised toilet seat, heavy-duty white polyethylene, raises seat level by 4-1/2". 15" seat width; 300-lb. weight capacity. 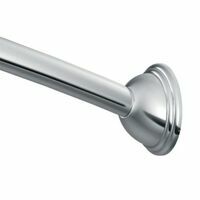 HOMEBASIX Shower Curtain Rod, Adjustable, Curved, 52 - 72 in Overall Length, Steel, Brushed Nickel, Includes: Mounting Hardware 100% EVA, water repellent, odorless and chlorine free. 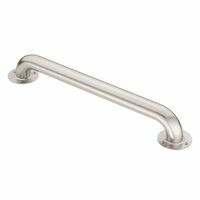 Safety grab bar, 1-1/2" tubing dia., Featuring an art-deco inspired blend of vintage design and classic lines. View box package. Includes towel ring, paper holder and 18? towel bar. Clean and contemporary look. Mirror polished chrome finish. 3 towel bar and 1 shelf. Size: 31-1/2''H x 25"W x 10"D. Boxed. 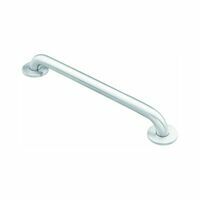 Donner Grab Bar, Universal, Series: 8900, Home Care, Contemporary, Modern, 500 lb Load Capacity, 1-1/2 in Rod Diameter, Concealed Screw Mounting, 3-1/2 in Mount Flange, 3 in Projection, 21-1/4 in Overall Length, Stainless Steel, Glacier/White, ADA Complaint, 18 in Bar Length Safety grab bar, 1-1/2" tubing dia., Curved design increases shower space. 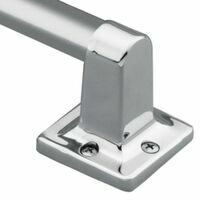 Rods are adjustable in length up to 72", Mounting hardware included. Safety grab bar, 1-1/2" tubing dia., Includes one each: 24" towel bar, 18" towel bar, toilet tissue holder, toothbrush/tumbler holder and soap dish. Brushed steel body with chrome base. 9.5"l x 9.5"w x 10.25"H Includes one each: 18" towel bar, 24" towel bar, paper holder, towel ring, and soap dish. View box package. 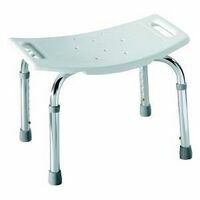 Plastic transfer bench features a convenient handheld shower holder and integrated soap tray, optional removable handle that helps aid patient balance, precise height adjustable legs that adjust in 1-inch increments, non-slip finish on seat. Rustproof, composite construction. 350-lb. weight capacity. Seat height: 17"-22"; seat depth: 16"; seat width: 17"; overall height: 32"-36"; overall width at base: 27-1/2"; overall depth at base: 16-1/2". Back and arms included.